A 17-year-old girl was sexually assaulted on a late night train by a stranger. British Transport Police is appealing for information following the incident on the 11.09pm Dunblane to Edinburgh service last Friday (December 16). 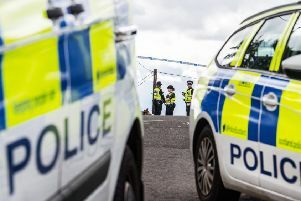 The victim was sitting in the middle carriage of the train when a man who was sitting in the seat next to her placed his hand on her legs twice shortly after it departed the Larbert station. The terrified girl was able to alert the train conductor who helped her to move seats away from the offender. The suspect is white, approximately 5ft 11ins, aged in his late twenties with strawberry blond hair. He was wearing a Christmas jumper and jeans at the time of the offence. Investigating officer PC Andrew McAinsh said: “Everyone should be able to travel on the railway network without experiencing unwanted sexual behaviour. “I would like to commend the victim for reporting what happened to her. She was very shaken by the incident and an investigation is underway to identify the offender. Officers would like to speak to anyone who witnessed the incident or has any information that could help with the investigation. Anyone with information is asked to call British Transport Police on 0800 40 50 40 or text 61016, quoting reference number 353 of 21/12.